Work should begin in Emerald Isle by about Wednesday, April 3. The contract deadline for completion is Tuesday, April 30. Greg Rudolph, manager of the Carteret County Shore Protection Office, the agency responsible for planning and overseeing the project, said nourishment resumed Saturday after the delay, and by Monday, crews had passed the Ocean Club and Summer Winds condominium complexes in Indian Beach, headed east. By mid-morning Tuesday, crews were working in front of Grand Villas in Indian Beach. Wednesday, work is scheduled to begin heading west again, through the rest of west Indian Beach toward Emerald Isle. “The project is still going very well,” Mr. Rudolph added Tuesday, “and we’re supposed to have north wind for a couple of days, which is very good” because it flattens the water, making it easier for the dredge to work. 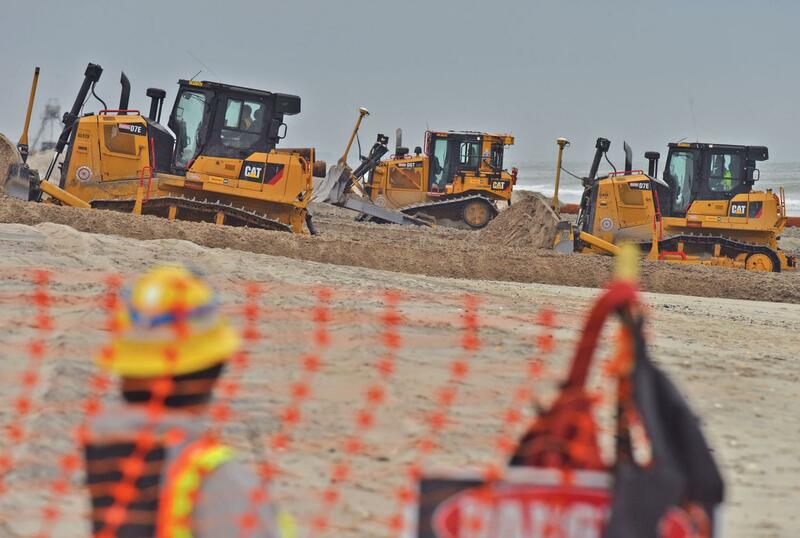 “It was a little cold on the beach this morning (Tuesday),” Mr. Rudolph added, with drizzle, temperatures in the upper 40s and winds gusting 20 to 30 mph, but he said crews are used to working in much harsher conditions.